What is the origin of Tarot? Mystical research can trace Tarot back to the old civilizations of Egypt, China, Persia and of course, Mother India; it is said that Tarot made its way to Europe through wandering gypsies as a divination tool. 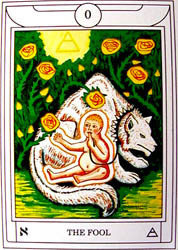 Modern Tarot was conceived at the Renaissance, “The Century of Light”, when in the 1500’s a noble Italian family ordered several games of painted cards known as “Tarocco”. The classical “Tarot de Marseilles” was designed in the XVIth Century, and, as early as in the1700’s, the Italians ceased to manufacture games and imported them from France. Samasathi practices and teaches Karmic Tarot: every action (a physical act, a positive/negative emotion, a mental construction) has an impact upon the Whole Universe; every action as an effect has a past cause. As Unity reigns over Duality, everything in our dual world is connected, and the Law of Synchronicity prevails in all our actions throughout our life on this earth, exactly like in Karmic Astrology or Reiki. Like in Reiki, the patient will “heal himself”: you will find the reply to a precise question (concrete or abstract) by carefully selecting cards upon your own intuition. The Medium offers his interpretation – the Science of Karmic Tarot demands many years of study and practice – and very often the Enquirer will “see the light” after having considered the Medium’s words. 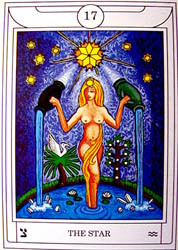 Tarot drawings are a divination method – from the Latin “divinare”: to guess – to help us understand our Karma and build a bridge between the conscious mind, the supraconscious (the Innocence of the Inner Child) and the subconscious. 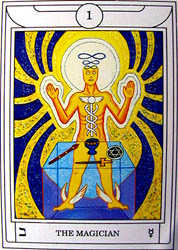 Samasathi chooses to read the pack of the Golden Dawn (from the Rosicrucian Order of the same name established at the end of the XIXth Century) as all cards contain the Cabalistic interpretation of the 22 paths of the “Tree of Life”, all the planets and signs of the Zodiac, and the symbolics of vibrant colours and shapes. There are many different ways of drawing the cards according to the specificity of the question (a new direction to life, a choice between two decisions, the way of dealing with a life event, etc…..). Exactly as Karmic Reiki uses the symbolism of chakras (from the Root to the Crown), Shiatsu the Law of the Tao (the circle of yin and yang), Martial Arts the fluidity of life forces, Samasathi’s Karmic Tarot will look at the spiritual message delivered by each card individually: from the 1 of the Magician being alone to confront the Universe to the 0 of the Fool having the possibility (if being careful) to become One with the Universe; Samasathi’s final interpretation of the whole drawing will give a precious indication to the Enquirer as to the current situation of his Path of Life.